Brown & Brown Insurance - Creative Mindworks, a Miami Florida based internationally ranked integrated marketing and advertising firm, solutions driven and Thinking Fresh Daily! Like most independent agencies, Brown & Brown faced a highly competitive environment populated by large, national insurance companies. To survive, they had to be agile and constantly adapt to their environment. 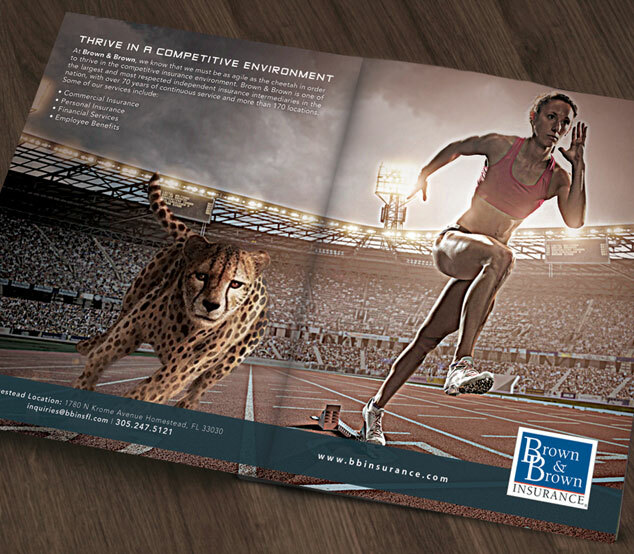 When approached by the agency for a new brand identity, a brochure and print ads, Creative Mindworks incorporated this theme of competition into their advertising with striking ads featuring wild animals in direct competition with human beings. The agency is still using the campaign today and credits our work for a large part of their success.